Bodean’s is a BBQ smokehouse specialising in American style BBQ of quality meats. The founder hailed from Kansas city Missouri and wanted to bring the best of his favourite cooking to London. BrewDog is a Scottish brewing company started by 2 young guys who wanted better beer and felt they could do a better job than the major breweries. Both companies have gone from strength to strength, with Bodean’s now operating 8 Smokehouses across London, and Brewdog managing to get a good foothold in the large retail supermarkets. 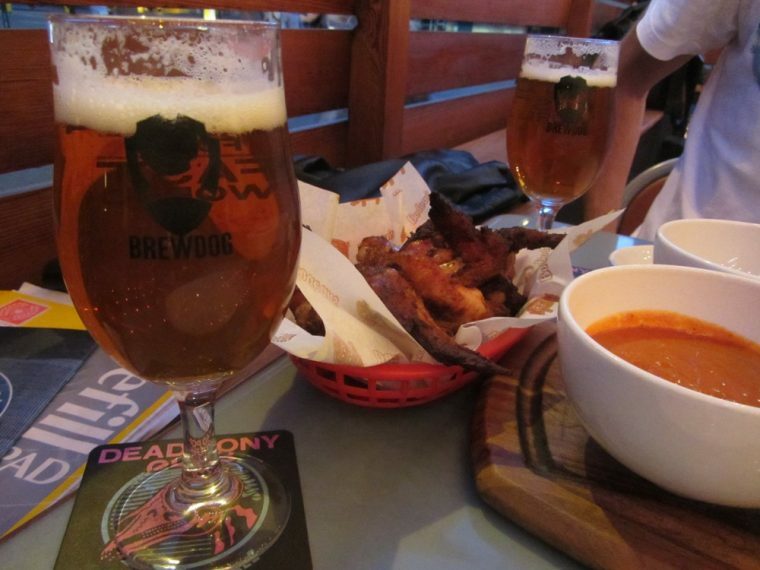 BBQs are kind of associated with beer in a natural way, so it’s no surprise that Bodean’s and Brewdog would get together to come up with some interesting pairings of meat and beer! They came up with a five-course dinner with paired beers, a tasting menu for beer lovers, if you like. First up we were offered the Large Buffalo chicken wings with a choice of sauces. BBQ, hot, Bourbon and Diabalo. This was paired with Brewdog’s Dead pony Club. The wings were wonderful! Very decently sized and super tasty and succulent in their own right even before you’d added any sauces. The sauce range was suitable for any taste range, varying from just BBQ up to pretty hot! Dead Pony Club is a beer I sought out after I’d heard that the name had tried to be banned by the Portman group for being offensive. Such big brother tactics are prone to backfire, and my discovery of the excellent range of Brewdog beers is a perfect example of that. 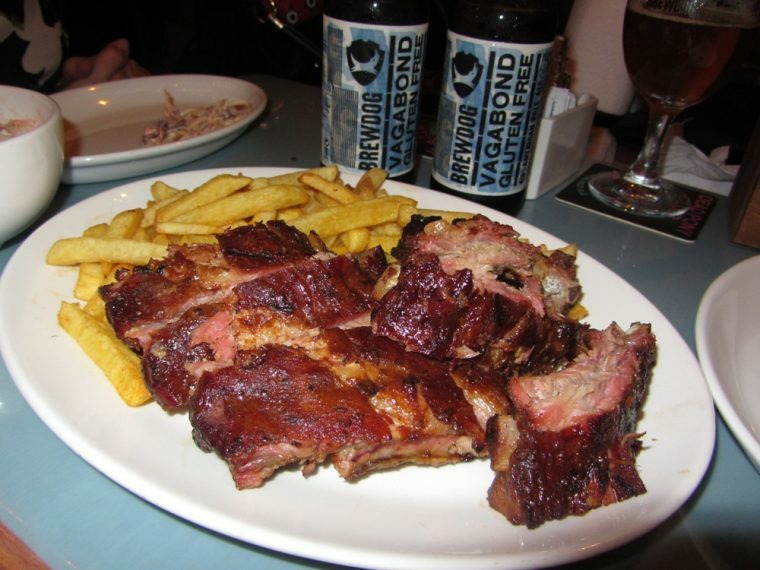 Next up were the Ribs, paired with Brewdog’s Vagabond Gluten-free beer. When Ribs are done right, they have the smoky slightly crunchy exterior, combined it with a melt in the mouth centre! These were right! It’s a very long time since I’ve tasted ribs this good at a commercial restaurant. I think you’ll be hard-pressed to find any better anywhere. 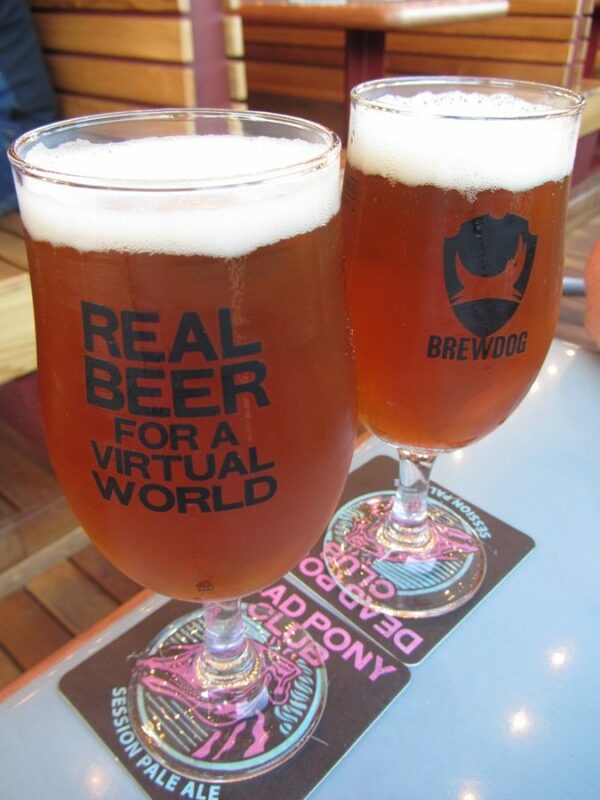 Brewdog’s Vagabond gluten-free beer is truly a beer that tastes no different from its gluten-containing relatives. 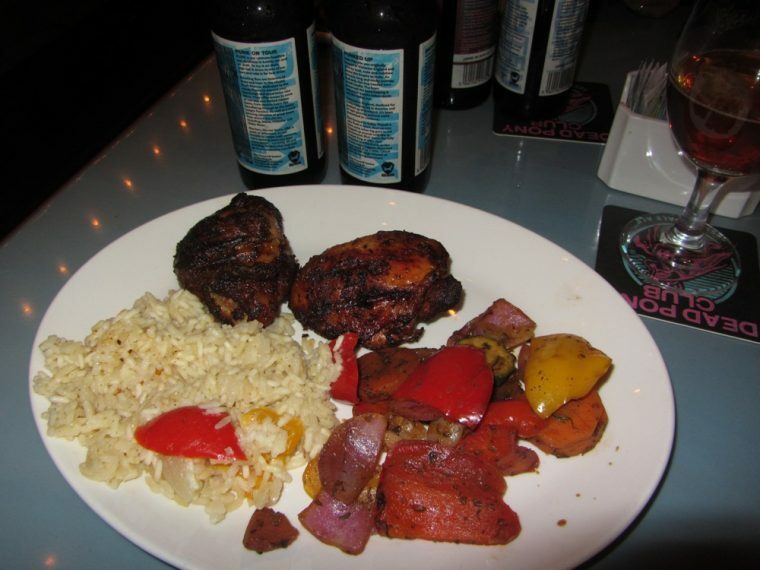 Most gluten-free beers are heat treated to remove the gluten, and this changes the taste. I’ve tried a number and they all generally fail to impress. Brewdog worked very hard and came up with an enzyme treatment that removed the gluten with no heat. The result is you simply would not know it was gluten-free…. It just tastes like a great beer. This was followed by the swordfish. 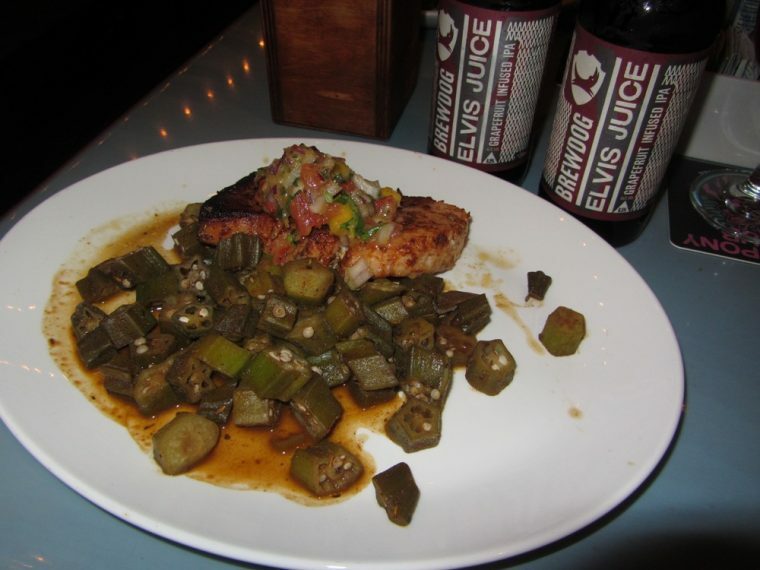 They were BBQd and served up with a fruity Mango salsa and an Okra side. Served with this dish was the amusingly named Elvis juice. This beer is an unusual one being infused with a hint of Grapefruit! It matched perfectly with the Mango salsa and on its own would make a great summertime beer in the garden drink. Jerk chicken was next and again the chicken had been marinated and perfectly cooked. No dried out around the edges meat here! This was paired with the firm Brewdog favourite and top seller Punk IPA. The slightly more bitter notes of the Punk IPA cutting through the richness of the chicken absolutely perfectly. The final dish was dessert, a chocolate brownie and ice cream. The accompaniment for dessert varies from one day to another, being chosen from one of the small batch brews of special beers. 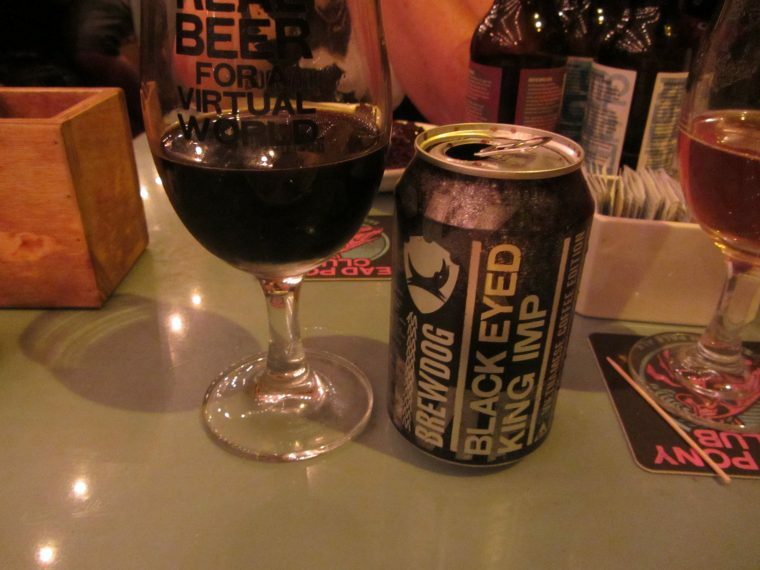 In our case, it was black-eyed king imperial, a stout of dark, deep chocolaty flavours. It had been infused with Vietnamese coffee beans as well and had a huge depth of flavour that is unusual for a stout. We agreed that if you found Port to be slightly too sweet a drink after a meal, this would be a fantastic alternative. The past decade has seen a build up of both Grilled, BBQed meats and good Burgers hitting the high street. Some have fallen by the wayside, and new one’s taken their place, but the general quality of this kind of food offering has risen hugely in my opinion. The limp old offerings of 15 years back have gone and there are a wealth of excellent choices available now in that sector of the market. Craft beer has mirrored this revival and growth, and again the choice these days is stunning. Both Bodean’s and Brewdog represent the upper echelons of these industries, and offering these hosted dinners is a match made in heaven. I recently tried BrewDog Punk IPA and absolutely love it! But, this is so cool to see that Bodean’s is a Kansas City BBQ style restaurant in the middle of London. Haven’t been to Kansas City, but Midwest American cuisine is some of the best here in North America. Will have to check this place out!